Shark Chute- Dive was planned as a multilevel and anchor dive after a 1 hr and 25 min surface interval to max depth of 60 ft. 20 min at 60 ft and 20 min at 40 ft with a 3 min safety stop. Dive started at 12:44 PM with a visibility of 60 ft and a water temperature of 77o F. Total dive lasted 45 min. 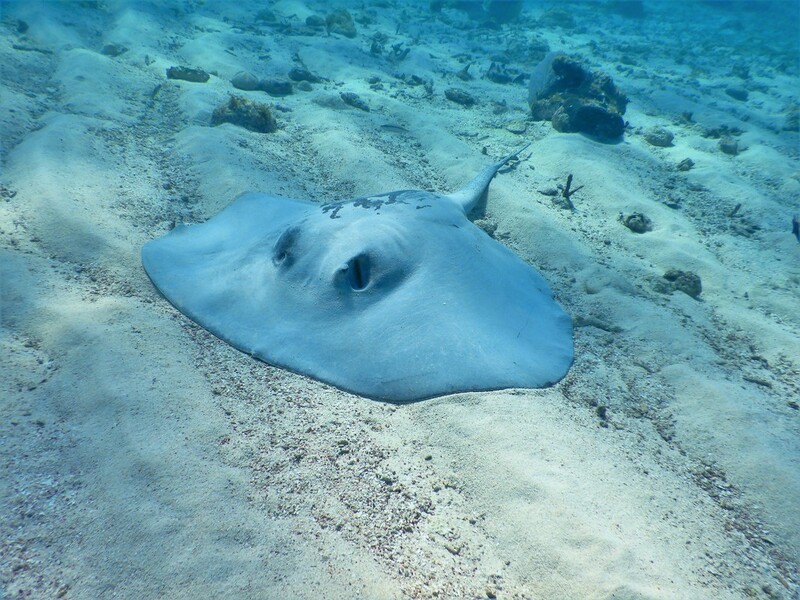 The dive site was pretty quiet with a couple lobsters, conchs, lionfish and the best of the dive was that we were able to see about 7 southern stingrays. Some of them were feeding while some of them were swimming around or hiding under the sand. J&R Wall- Dive was planned as a multilevel and anchor dive to a max depth of 70 ft. 20 min at 70 ft and 20 min at 40 ft with a 3 min safety Stop. Dive started at 10:50 AM with a visibility of 80+ ft. The water temperature was 76 o F. Total dive lasted 40 min. During the dive we were able to observe pederson cleaner shrimp, pistol shrimp, mutton snapper, lobsters and a fury sea cucumber. The Lounge- Dive was planned as a multilevel and anchor dive after a 1 hr and 33 min surface interval to max depth of 60 ft. 20 min at 60 ft and 20 min at 40 ft with a 3 min safety stop. Dive started at 1:04 PM with a visibility of 80+ ft and a water temperature of 76o F. Total dive lasted 46 min and the extra minutes were spent at shallow depth since guest were doing much better with air. During the dive we were able to observe lobster, spotted moray eel, green moray eel and some southern sting ray.